BANKRUPT BILLIONAIRE SEAN Quinn has admitted that he was wrong to take €280 million out of his company Quinn Insurance to cover losses he incurred from Anglo Irish Bank. “I shouldn’t have taken money out, I was a bold boy” he said “and I’ve always accepted that”. He was later fined by the Financial Regulator for doing so. Speaking to Newstalk’s Pat Kenny Show, he said that building up a substantial stake in Anglo Irish Bank, only to lose €3.2 billion when the bank was nationalised in 2009, didn’t make him a “gambler”. 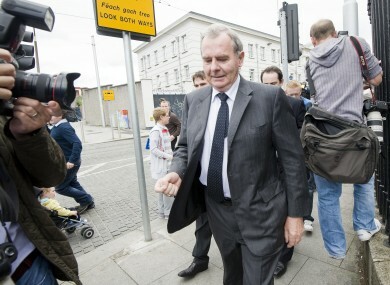 Quinn said the collapse of his family’s business was “very badly handled”. “We were a very successful company… a hugely profitable operation”. All of a sudden I stupidly got involved in buying shares in Anglo Irish Bank. On financing the current court cases the family faces, he said there are “plenty of people who help to fund the case”. “The reputation we’ve been given… is that we weere stealing government assets,” he said, “and if I was on the opposite side, if I was reading those papers or watching those television interviews, I would say that this was a terrible family. Quinn said that it was “an absolute scandal” that he was not granted bankruptcy in Northern Ireland, and said he intends to set-up new businesses once he serves the term of his current bankruptcy. “My ambition, as long as there’s a bit of breath and blood left in me, it will always be to start something again,” he said. Email “Sean Quinn: "I was a bold boy, I accept that"”. Feedback on “Sean Quinn: "I was a bold boy, I accept that"”.